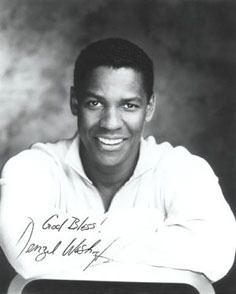 AKA Denzel Jermaine Washington, Jr.
Denzel Washington won Oscars as the rebellious slave unwilling to carry the American flag in the Civil War film Glory with Matthew Broderick, and as the crooked cop in Training Day with Ethan Hawke. In 1996 he became the first African-American to be judged People magazine's Sexiest Man Alive. Washington says he learned about performing watching his father, a preacher, electrify the crowd at Sunday services, and he learned about drama and emotion listening to the chatter in his mother's beauty salon. He grew up in an integrated neighborhood on the edge of the Bronx, where West Indians, Italians, and blacks were neighbors. In college he earned a degree in journalism, but also appeared in several college plays and found acting more interesting. Between low-paid stage roles, he earned the rent as a postal worker, garbage man, and factory worker. His first film, Carbon Copy, had Washington as the illegitimate son of George Segal, and after the movie bombed Washington went to work as an urban recreation center, overseeing kids playing sports and teaching once-a-week acting classes. His breakthrough role was on TV's St Elsewhere with Ed Flanders and Howie Mandel, where Washington played the nervous new resident Dr Phillip Chandler. He has been considered a "prestige" Hollywood actor since his Oscar-nominated performance as Steve Biko in the anti-apartheid film Cry Freedom. He played the skirt-chasing trumpet-player in Mo' Better Blues with Wesley Snipes, the impatient civil rights leader Malcolm X, the homophobic attorney who represented Tom Hanks in Philadelphia, First Officer to Gene Hackman in Crimson Tide, Dakota Fanning's bodyguard in Man on Fire, the cop unraveling a hostage situation in Inside Man with Clive Owen, and the time-traveling hero of Deja Vu with Val Kilmer. He met his wife, actress Paulette Pearson, when they both appeared in Wilma, the biography of track star Wilma Rudolph. Their eldest son, John David Washington, was a top running back at Morehouse College, and is currently on the practice squad for the St Louis Rams of the National Football League. His parents divorced when Washington was in his early teens, and he sought refuge at the local Boys Club, where he received guidance that, he says, set him on "the path to purpose". Since becoming a movie star, he has long been the spokesman for the Boys and Girls Clubs of America, which receives proceeds from Washington's inspirational book A Hand to Guide Me. His generosity in supporting other charities rarely makes the news because his contributions are not accompanied by a press release, but he is known to have given millions to the Children's Fund of South Africa, Fisher Houses (which provides low-cost lodging for military families while soldiers are hospitalized), and the Church of God in Christ -- the denomination Washington grew up in, and the church his father preached for.